Planning a trip to Europe? Let us know, and we're pretty likely to hop in the car and join you on your adventure (is there an echo on this blog?). When Arish (who worked with Kristin at Dow Lohnes) sent word that he would be in Budapest and Vienna for Thanksgiving, we still didn't know what our plans would be for the holiday. After some debate over whether we'd travel back to the states or someplace else for turkey day, we opted to crash Arish's trip. Instead of watching the Macy's Thanksgiving Day parade, we joined Arish, his friends Meredith and Jeff, and their munchkin Parker (who was an amazing little traveler) on Thursday. To begin our sightseeing, we headed up to the castle district (a UNESCO world heritage site) on the Buda side of Budapest by funicular. We spent some time checking out the views from Fishermen's Bastion and Matyas (Matthias) Church. Despite the cold, the historic buildings and great views made for some fun sightseeing. Stop for a snack and hot beverage, and it will be nighttime when you emerge. Matthias Church was built in the 14th century and is one of many buildings along the Danube that are lit beautifully at night, which comes early this time of year. Behind the church is the Halászbástya (Fisherman's Bastion) overlooking the river. It was built around 1900 as a terrace to enjoy the views over Pest up and down the river and was named after the stretch of the city wall that fisherman were charged with defending in the Middle Ages. It's even more impressive when you consider all of this was rebuilt after the 50-day Siege of Budapest at the end of WWII. German and Soviet troops fought hard and destroyed most of the original infrastructure while the 800,000 citizens were trapped in town without much food or other provisions. We checked out the palace area and then it was time to head back to the apartment Arish et al. had rented for our Thanksgiving feast. There isn't much Turkey to be found in Hungry so instead we stuffed ourselves on Greek food. Yum. 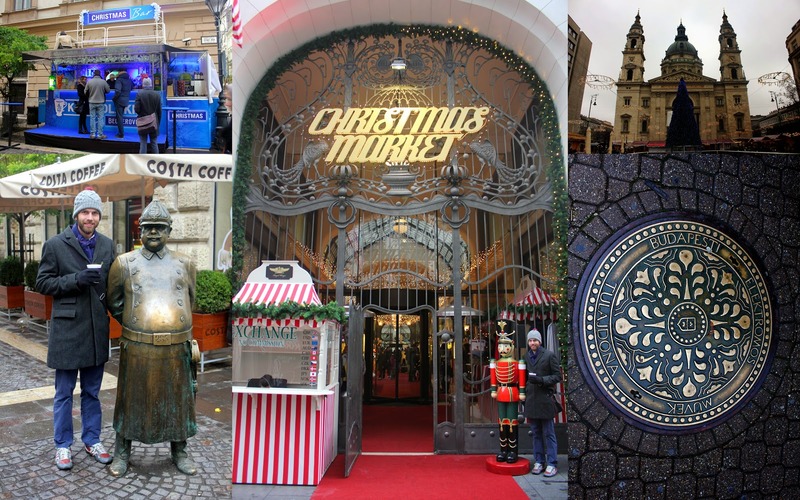 We hit the ground running on Friday to make sure we caught some more traditional Budapest sights -- Black Friday sales. 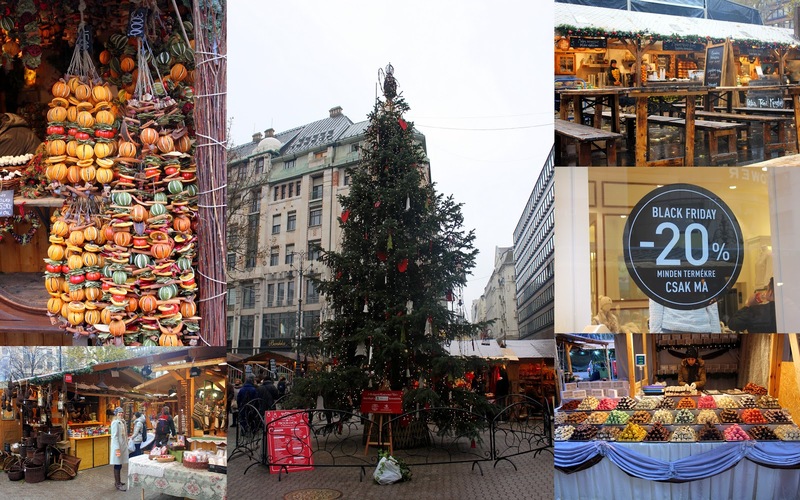 Luckily most of our day was spent wandering around the Christmas market that was spread throughout the city. Matt made sure to hang with some colorful locals and check out the beverage options at the Christmas bar. Matt made some new friends. 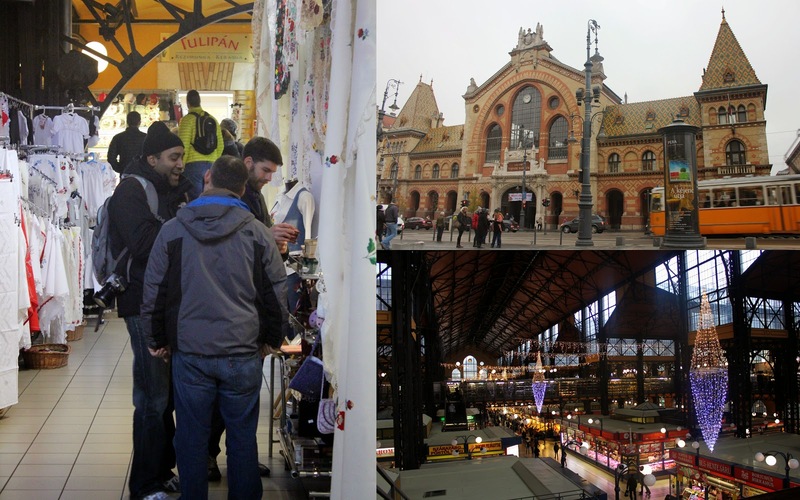 We found Arish and headed over to the The Great Market Hall for some more shopping time. It was full of interesting foods and souvenirs that made for some good Christmas present shopping. Q: How long does it take 3 men to open a puzzle box. A: Way longer than you think. The next morning we hopped in the car and headed to Vienna ... where we picked up Arish at the airport (long story). And headed to another Christmas market. Waiting in line for huge donut things. Might not me the first time in line for the gentleman on the right. Thanks for letting us crash your holiday Arish!